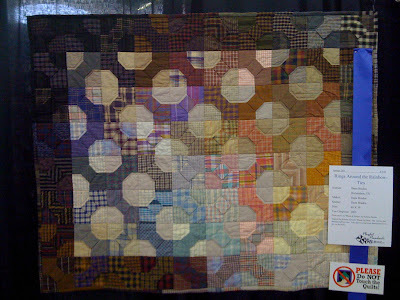 Guess what/who I thought of when I saw this Plaid Bow Tie quilt at the Dallas Quilt show yesterday? This is called Rings Around the Rainbow Ties by Dana Braden of Richardson, Texas. By this point in the show I had run of out battery for the camera and took this with my phone, so the quality of the image could be better, but isn’t it great? The background fabrics in this quilt are also plaid. It’s really plaid-happy. The bow-tie blocks aren’t quite the same pattern as ours–they are the three-dimensional kind, but I thought the look was very much the same.